Our clients work on limited budgets yet have a need for the same type of professional talent used by mega-marketers. So we pioneered the concept Experts On Call. 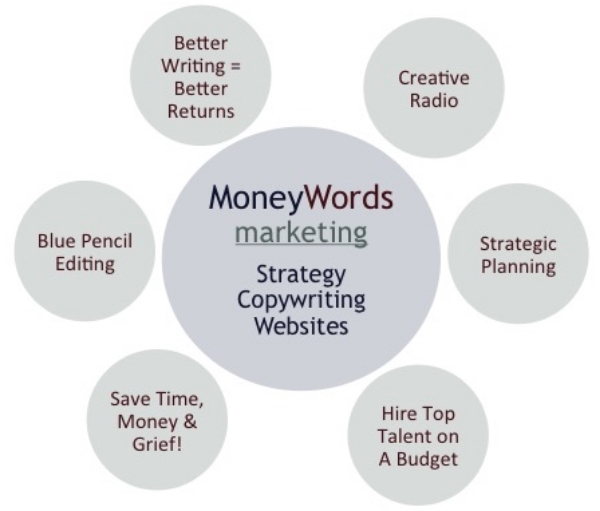 MoneyWords Marketing works exclusively with entrepreneurial and franchise businesses with sales revenues from $250,000 to $50 Million. These companies, that I call "Bedrock Businesses", make up 49% of the businesses in the country, provide 46% of the employment, 41% of the payroll, and 30% of the revenues. Yet most advertising agencies and marketing consultants, and even most books on marketing, continue to focus on the methods and practices of the mega-marketers like Coca-Cola, Proctor & Gamble, General Motors, etc. If you’re not a mega-marketer, don't try to copy their marketing formula. You can’t afford to spend your money building name awareness and little else. We are dedicated to the idea that marketing makes money. The base of all great marketing communications is a compelling branding strategy - and that's what MoneyWords Marketing is focused on. Our unique approach to Marketing Strategy allows you to maximize your results with compelling, differentiating marketing messages. “Blue Pencil" Editing and Mentoring can give you access to a master copywriter for a fraction of the price of a part-time novice. Ed Phillips' Business Speakers Academy - Speak Your Way To Success! As each business is unique, we encourage you to start by requesting a Free Evaluation!